Paris Paradis: A Free and So Nice Outdoors Exhibition! A pleasant exhibition of photographs is taking place until the end of March in the Palais Royal Gardens in Paris. It is called: ‘Paris Paradis, un journal photographique de Nicolas Guilbert’. It is in open-air and free and can be seen at any time as the photographs are lit up at night! For thirty years the Parisian artist Nicolas Guilbert has been walking all over Paris so as to capture new pictures of the city. He takes an amused look at it by catching at the right time photographic opportunities: Parisian people or tourists, street scenes, metro stations or famous monuments. I like his view of Paris which is in the same time unusual, powerful and unpretentious. The location of the exhibition looks like an allusion to the youth of the artist: Nicolas Guilbert used to work as a scene shifter in the nearby Comedie Française when he was 16… and the fences and his works were put up last January by some scene shifters of the theatre! 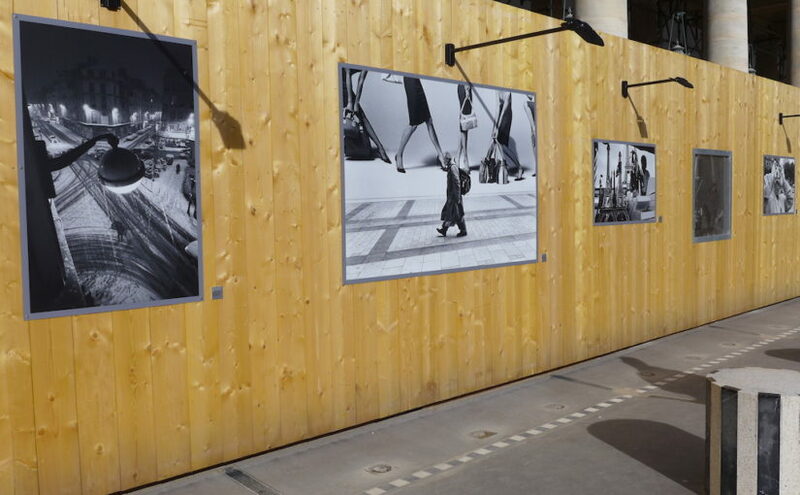 About 50 photographs representing the best of his most recent book ‘Paris Paradis’ are currently exhibited on wooden fences at the entrance of the Palais Royal Gardens next to the famous Buren’s columns: Black & White or in colour, indoor or outdoor, showing people or animals, streets or monuments. I love all of them. One of my favourites is: ‘Irène Krenz-Mouquin et Elliott, quai de l’horloge, 1er’. The whole makes a poetic travel through Paris. Not to be missed! Format ImagePosted on 2018-03-20 Categories EventsTags Events, Exhibition, free, Palais Royal Gardens, Paris, Paris ParadisLeave a comment on Paris Paradis: A Free and So Nice Outdoors Exhibition!